"Goyt Valley here we come!" Oil on Gesso primed plywood, 8" X 10"
Earlier this year, I decided to enter the Buxton Spa Prize plein-air painting competition. I arrived just after ten in the beautiful Peak District town of Buxton on a lovely sunny morning in May and everything was looking good. The entry fee of £25 entitles one to pick a random location out of the jar in the competition office at the top of the stairs of No. 6 Tearooms in Buxton, which I did with the fervent hope that I would draw a location where I would find a subject to inspire my artistic appetite. If I had paid an extra £15 for a second entry, I would have been able to select the second location instead of having to accept the lottery ticket entry I ended up with. Being a mean old Scotsman (!) I chose not to pay the additional fifteen quid and just went with the random piece of paper pulled from the jar, which read: “Location number X: Anywhere on the Manchester Road between Buxton and Cold Springs Farm”. When I finally found the Manchester Road, and started driving up the hill, I began to realise my mistake. The first half-mile was a pleasant tree-lined residential road on a hill going out of Buxton, with substantial stone-built houses hiding behind mature hedges and stone walls. The road then opened out into a fairly nondescript country road bordered by a wooded hill on one side and on the other, more private properties hidden behind stone walls with glimpses of distant fields. I turned the car at Cold Springs Farm and drove slowly back down the road, looking for “the definitive view” of Manchester Road which would allow me to create such a ‘tour-de-force’ that the judges would be completely stunned by it’s beauty and perfection and would unanimously agree that this year’s £5000 prize just had to go to me. Aye, right, in your dreams, Johnson! The sun was shining attractively across a tree onto the road next to the farm – a possible subject – but not the most representative view of Buxton…the search continued. At the bottom of the hill again, I stopped the car, got out and walked up and down to see if I could find a good subject & position to paint from. The few buildings that might have been of interest to me were either obscured or only partly visible from the Manchester Road. I didn’t want to risk straying around a corner to get a more paintable view because I had no way of knowing how strictly the rules would be applied, so I played safe and looked for a suitable view only up or down this particular stretch of road. The clock was ticking – it was approaching ten-thirty and I still hadn’t found a spot that appealed to me. I drove back to Cold Springs Farm and decided I had to make the best of it, otherwise I’d run out of time. There was an old quarry opposite the farm where the cold springs are fenced off – the view from the top of the quarry hill looking over to Buxton and the hills beyond would have made an ideal subject; but I didn’t dare take the risk of straying from the road for fear of being disqualified – and in any case I didn’t want to fall foul of the English laws of trespass (no enlightened outdoor access rights here!) I used another precious ten minutes knocking the door of the farmhouse trying in vain to find someone who would give me permission to park the car in their yard. Eventually, round the side of the house, a grey-haired lady came to a window and nodded her head to my shouted request! I set up my easel at the side of the road and got stuck in. The chap in the office above No 6 Tearooms had taken my mobile phone number and promised (threatened?!!) to visit me once I had let him know where I was, so I had to work quickly to get something down before he arrived. Some time later, he phoned to say he wouldn’t manage to visit me today, would I be coming back? I said “No, I was only down from Scotland for a visit to family in Manchester and we had plans for the other days.” He said not to worry. I was impressed that the organisers actually took the trouble to check that artists are actually devoting the minimum four hours on location as stipulated in the competition rules. 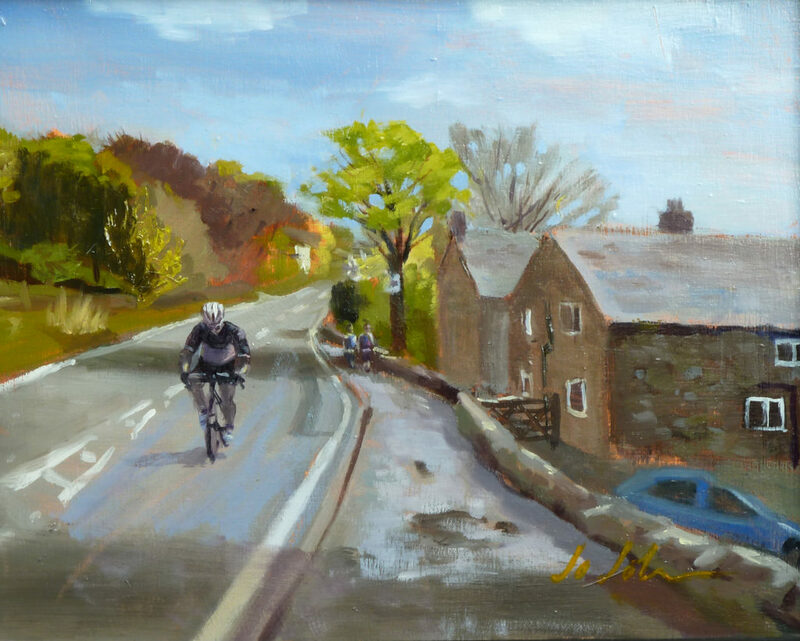 Several cyclists toiled up the hill as I painted. 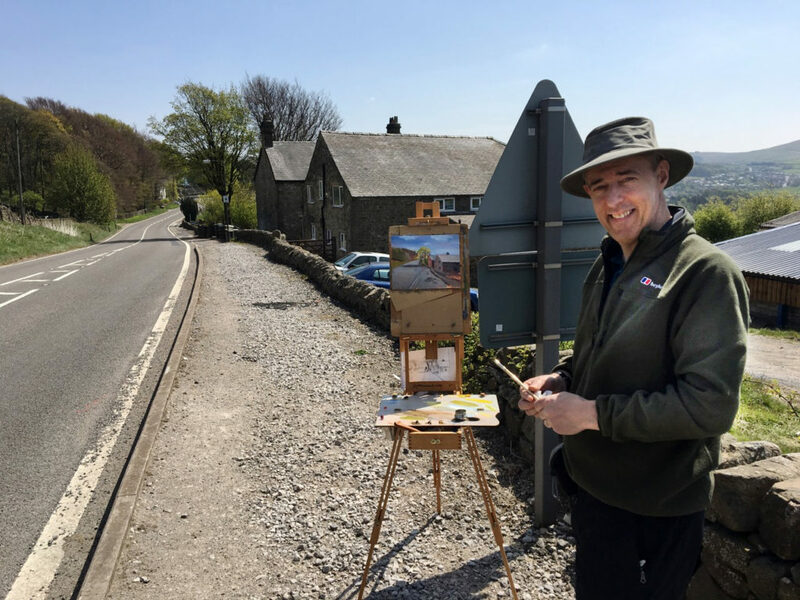 One of them stopped and chatted – he was on his way to the Goyt Valley, a well known beauty spot which can be reached via a minor road which branches off the Manchester Road just above Cold Springs Farm. He jokingly asked if I would include him in the painting! I think the addition adds a bit of life and gives the painting a touch of local interest too. All of a sudden my concentration was interrupted by the appearance of a man with a cap on his head and a woman wearing jodhpurs. “’oo gave you permission to park ‘ere?” he asked in a no-nonsense northern accent. When I told them about the lady at the window, he said, “Oh she’s not the owner – we are!” Anyhow, when they realised I hadn’t just parked without seeking permission, they relaxed and he explained that as the owners, they had spent several thousands widening the entrance to the property and were plagued by people using it as a turning area. The farmer, whose name is Syd, showed an interest in my painting and asked if I would sell it to him! I had to explain that this one was going into the Buxton Spa prize comp but that I could paint him another if he liked. We agreed terms and I took his contact details. I stopped about one-o’clock and enjoyed the sandwiches Norma had made for my lunch, drank a good cup of coffee from the flask and set to work again. After an hour or so, a car drew up and the guy (Neil?) from the competition office appeared. We chatted briefly and he took a photo of me at my easel “for publicity purposes” and drove off. Just as I was finishing up, Syd came back to ask if I could do him a painting from the other side of the house. 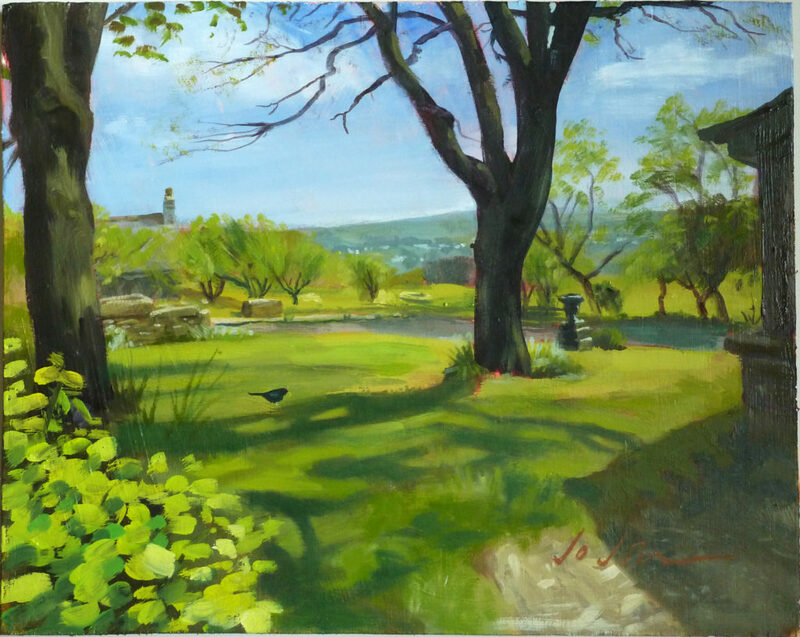 After taking a few photos around the property, which I later emailed for him to choose from, Syd requested that I paint the garden view – which would probably have been a better subject for the Buxton Spa competition than the above painting which I was obliged to submit. Below is the finished commission, from Cold Springs Farm garden looking towards Buxton and the hills beyond. Funny how things turn out sometimes, isn’t it? IT’S GONNA BE JUST BEAUTIFUL!